While driving home through the Poconos on a clear September day, I couldn’t pass up a chance to do a little exploring. 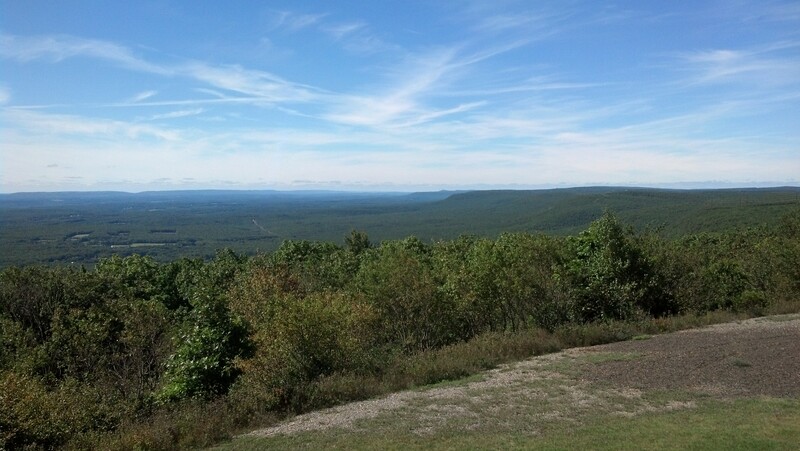 So we made the drive up to Big Pocono State Park to take in the views. I was there several years ago on a hazy spring day, so it was nice to see the views on a clear day. I was impressed to be able to see the Catskills, about a hundred miles away. I could also see a vast section of the Appalachian Trail, from New Jersey all the way to the Hawk Mountain area near Port Clinton. The top of the mountain has a stunted forest of trees. The views are truly vast. With Autumn quickly approaching, this is the place to go to see the foliage. The state park has 8 miles of trails, many of them are also open to mountain biking. The park is only open during the day. More info on the park.